Books, research proposals, screenplays, and scripts, are all daunting, large-scale writing projects. Most authors don't just run a word processor and bang them out, start to finish, ending up with a complete work. The creative process is often complex, and there is much background research, planning, shuffling and reshuffling of segments, editing and re-editing until the manuscript is done. Mac favorite Scrivener ($40, thirty-day free trial) has a Windows version, recently out of beta, that helps writers compose major projects by breaking them down into manageable bits, organizing research material, and more. Scrivener's work environment is rich, but many elements can be toggled off as needed. Scrivener recognizes that every author works differently. Rather than impose one "ideal" workflow for writing, provides an arsenal of research, planning, writing, and editing tools you can choose from. Scrivener also ships with a friendly tutorial packaged as a Scrivener writing project that walks you step-by-step through the most important features. The tutorial is well-written and thorough; it took me about two hours to work through. Not very fast, but a good investment of time: When I was done, I felt like I could really start using Scrivener. The most important thing Scrivener lets you do is work on your project in segments. There are two views, the corkboard and the outline view, which let you get a bird's-eye view of your segments, reshuffle them, and create new ones as needed. The corkboard represents each of your segments as an index card with a title and a synopsis, while the outline view shows more fields. A third view, called the scrivenings view, lets you see you view all selected segments as one continuous document, to see how they read in sequence. 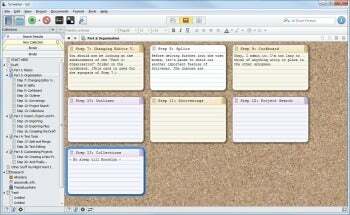 Scrivener's corkboard view lets you visualize your work and reshuffle it as needed. You can use scrivenings view to read your entire work or chapter, but you can also select several arbitrary segments and view them in scrivenings mode, even if they don't directly follow each other in the final work. This can be useful for making sure an individual plot line flows correctly, for example. Scrivener also lets you label your segments with labels such as Scene, Idea, Character Notes, or anything else. You can also assign each segment a status label, such as First Draft, Revised Draft, etc. For even finer-grained categorization, Scrivener lets you assign arbitrary keywords out of a keyword hierarchy you define. You can then search for segments labeled with specific keywords (such as the name of a character), and read them in isolation using scrivenings mode. You can even save your searches for future use. Scrivener includes a powerful name generator, making it easy to come up with good character names. Scrivener's other writing aids include a flexible character name generator--not so useful for research papers, perhaps, but a boon for fiction writers. It lets you pick an ethnicity for the first and last name (separately, so you can mix), pick which letter the name should start with, and even search by meaning. 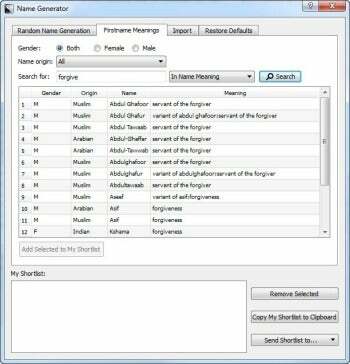 Neal Stephenson used Scrivener for his latest novel, REAMDE, and indeed, I recognized one of the names in the generator (Abdul-Ghaffar, "servant of the forgiver" in Arabic). Once you are ready to share your manuscript, you can export it using Scrivener's powerful compilation functionality. You can make it into a PDF document, an RTF file, an HTML webpage, and more. 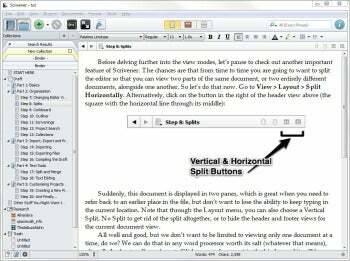 A simple template engine allows some control over the manuscript's appearance, but Scrivener doesn't try to be a full-fledged typesetting program. Scrivener for Windows lags behind its Mac counterpart in version numbers and features, but the version I evaluated, 1.2, feels like a mature and powerful product. If you are serious about writing, you should check it out. Popular creative writing tool Scrivener helps authors create books, research proposals, and other long-form works.